A Slice of Life: A Visit from the Fairy Hobmother!! A Visit from the Fairy Hobmother!! There’s a great buzz in the blogosphere lately! Have you met Fairy Hobmother already? If not, then you’d probably want to meet him (yes he’s a guy!) for he is the most generous fairy all of. Fairy Hobmother is spreading joy and sprinkling some love on many bloggers giving gifts you can’t resist. Actually, I’ve been seeing him on many blog across the globe for couple of months now when I do my rounds of blog hopping. Seeing bloggers got ecstatic over his visits at their blogs made me wish that someday he’ll drop by my blogs and sprinkle some fairy dusts too. I left my trail by leaving comments on other blogs that he has chosen hoping he’d pick me next. Lo and behold, he found me! Few days ago, when I was about to sleep, his fairy dust encouraged me to open my mail. To my surprise, it is a mail from Fairy Hobmother telling me that my blogs (yes blogs!) where chosen to receive surprises for the good job I have done on them. Wow, I was smiling from ear to ear and what a great way to end my day. Thank you Fairy Hobmother for granting my wish! Now, if you also believe in fairies, a surprise gift might be yours. Just believe. Who knows, you might end up buying goodies that you can put on your for your family to enjoy. The ever-generous Fairy Hobmother is still roaming the blogosphere looking for deserving blogs. So comment away and who knows he’ll contact you and shower you also with gifts. Wow! I'm intrigued! Hope he visits one of my blogs, too! I hope he visits my blogs too soon!! I would love for him to visit my blogs too! wow! i hope he visits my blog too! 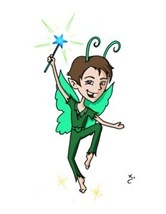 Hope the fairy hobmother will choose my blogs too. He is very much welcome to spread his fairy dust there. I hope you visit my blogs too Fairy Hobmother! Please, please visit my blog to fairy hobmother! I'm so intrigued by the Fairy Hobmother..hope I'll get a visit, too, from him. Oh dear Fairy Hobmother, grace us with your exciting gifts. Hooray!!! Well, I'm not sure what he does, but if it's good for blogs, then I hope he stops by to check out mine.